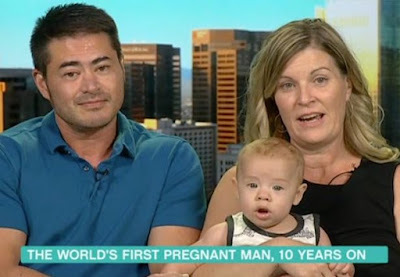 The world's first pregnant man has revealed he is open to carrying another child. 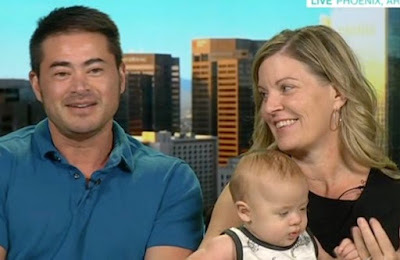 Thomas Beatie made the headlines in 2007 after he became pregnant through artificial insemination and gave birth to a daughter. The 44-year-old, who has given birth to three children, has since split from first wife Nancy Gillespie and remarried to Amber Beatie. The couple have a son, Jackson, who was carried by Amber, but Thomas won't rule out going through another pregnancy himself. But this time he would have to have a Caesarean section because he has had 'lower surgery' to create a functioning peen. On whether he would carry another child, Thomas said: "I would if I could. The issue is we still have frozen embryos related to this guy [Jackson] here. That's a big decision we have to make. "She [Amber] said if I wanted a girl I'd have to do it myself and have to carry." This Morning host Eamonn Holmes admitted the pair weren't "short of options" between them. While wife Ruth Langsford revealed that Thomas would no longer be able to give birth as he now has male genitalia. On whether he would extend their family, Thomas said: "I wouldn’t rule it out completely. I have had lower survey so I'd have to have a Caesarean for sure. "I wouldn’t want to tear anything unnecessarily - you know what I mean. "Amber successfully carried and she's older. She's 48 right now, so it's still possible for her to do it as well." Thomas said his children don't see him as female but know that it is part of his past. He added: "I have zero regrets in life in general. I feel the picture was provocative but it sparked a conversation which is very important. There are people like me who want families.